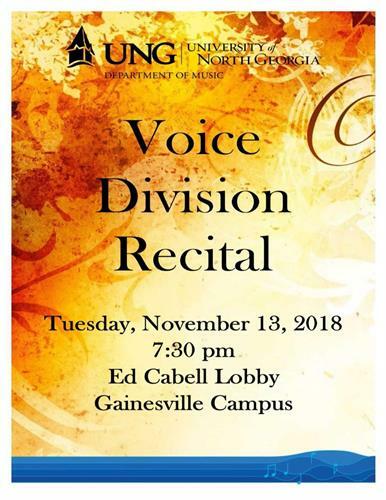 On Tuesday, November 13 at 7:30 PM, the students of the University of North Georgia Voice Division will present a division recital in the Ed Cabell Theatre Lobby on the UNG Gainesville Campus. The program will feature a variety of vocal works from both the art song and opera genres, spanning from the baroque through the present. We cordially invite you to attend this free performance. For more information, please, contact the University of North Georgia Department of Music at 678-717-3930 or music@ung.edu.